Looking for the best way to start of a sunday, or any day for that matter, but can’t seem to find the perfect spot? You know, that place with the perfect ratio of breakfast to lunch. Or maybe you’re looking for the one with the most epic mimosas. 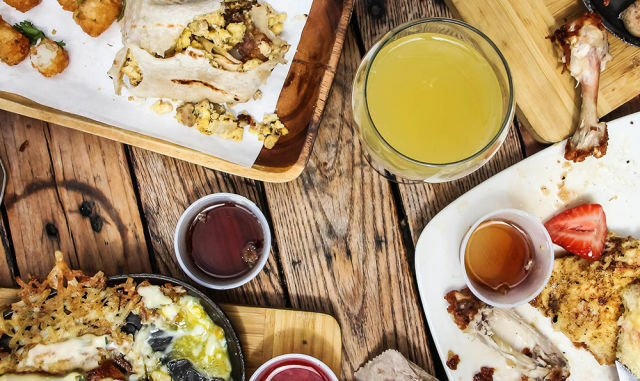 Our carefully crafted list of the best brunch spots is here to help! Your morning will be anything but dull if you begin your day at this lively Cuban fusion restaurant. Surrounded by walls decorated with festive murals, and sitting atop their signature conga drum bar stools you will feel immersed in the food and music of this latin american country. Even if the colorful atmosphere doesn’t impress you, the food surely will. With options ranging from classic breakfast, to a lunch selection that encapsulates the culture tastes of cuba, you undoubtedly find something to entice your tastebuds. However, besides the atmosphere, and the food, we all know the true brunch essential, bottomless mimosas. Well this spot goes above and beyond your typical bottomless option, but offers all of their brunch cocktails with a bottomless option. So if you’re looking to keep your brunch saucey, this is a good spot to consider! If you’re planning to spend the morning in the East Village this Ukrainian hole in the wall is definitely worth investigating. Perhaps Ukrainian food isn’t what first comes to mind when considering brunch but this staple of East Ninth street has been pulling in customers since 1954. Once a newsstand, serving soup and sandwiches, this little coffee shop offers anything from classic Ukrainian specialties to classic breakfast favorites with a cultural twist. Veselka bakes all pastries fresh each day, along with their potato pancakes and pierogi, giving this upscale east village coffee shop that hometown feel its history deserves. Jackson Hole is a certified amazing burger experience, or so say the Time Out New York Eating and Drinking Awards. The family owned restaurant has been a staple of New York City since 1972 serving over fifty specialty burgers, each more delicious than the last. If burgers aren’t your thing, they have got you covered! Offering a wide variety chicken “bronco” sandwiches, Tex-Mex dishes and classic American breakfasts, Jackson Hole is a meat lovers paradise. Although it’s known as the “home of the 7oz burger” the Hole still welcomes vegetarians with a few options for the herbivores. To prove their devotion to freshness, each Jackson Hole restaurant is based on an “open kitchen” design, allowing you to see where your food is coming from and how it is prepared. If you’re looking for something on the lighter side look no further than Mangia. A resturaunt created because of the need recognized for a meal demographic somewhere between the hot dog vendor on the street corner, and upscale fine dining for New York&apos;s’ professionals. Offering a rustic italian cuisine, Mangia has found a way to offer upscale food in a casual “dine in” or “take out” environment. Featuring brunch offerings like their “build your own breakfast sandwich,” to more traditional italian fares like the Ficelle, you really cannot go wrong with these freshly made meals. Craving a little slice of Paris this morning? La Tarte Flambee in New York, NY, brings you all the flavors of france at a fraction of the cost. This clandestine get away fuses the luxuries of a french meal with an American classic, pizza. Each pizza featuring a creme fraiche base, and topping choices with every meat and cheese combination that encapsulates the essence of french cuisine. Pizza not a morning favorite for you? No fear, a brunch menu is also here! La Tarte Flambee puts a parisian spin on your favorite brunch classics, such as eggs and bacon served with salad and a croissant, or an eggs benedict served on a potato pancake with goat cheese! This is the perfect spot for your New York to Paris hide away. Moody Tongue Tap Room to Open in Pilsen! REJOICE! © FoodBoss. All rights reserved. Sign up for our newsletter to get special offers from restaurants in your neighborhood! Got it, thanks! Oops, try again!